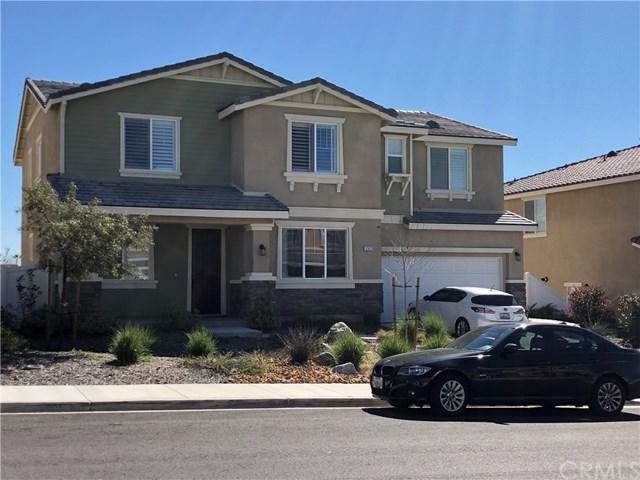 12620 Lemon Tree Road, Moreno Valley, CA 92555 (#WS19061127) :: Ardent Real Estate Group, Inc. This beautiful 3,454 sqft. home has 5 Bedrooms, 4 full bath, 2 car attached garage, 2 story home built in 2016. 1st floor has 1 bedroom, den, full bath. Gourmet Kitchen with newer stainless steel appliances, 30" double oven, quartz counter tops and large size island with double stainless steel sink. Kitchen has large pantry plus large storage room to the side. Great room connected to kitchen. Upstairs has master bedroom with his & her separate walk in closet, spacious master bath, separate shower and tub, and enclosed toilet. 2nd floor also has loft for entertainment area. Other rooms on the 2nd floor includes a suite with full bath, 2 more bedrooms and 1 more full bath. Separate laundry room also located on 2nd floor. Ample windows fitted with Plantation shutters through out and upgraded windows to show off breathtaking views of city lights and mountains. Large front and back yard located in the coveted Rancho Belago community of Pacific Willow. Conveniently located only 1 block from Stoneridge Town Center for shopping, banks and restaurants such as Walmart, Target, Chili's, Best Buy, LA Fitness, and more. 1 block from Valley View High School, 2 blocks away from Valley View Middle School and 2 blocks away from Bear Valley Elementary School. 10 Mins drive to UC Riverside.